Unfortunately, even the highest quality window film won’t last forever, and at some stage will wear out to the point where it needs to be removed. The two most prominent signs of expired film are 1) bubbling, and 2) purpling. 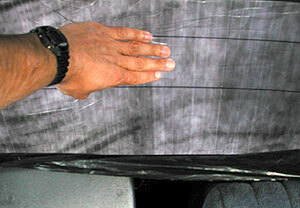 Bubbling film is caused by natural deterioration of the underlying adhesive. Once you spot your first bubble, you can be sure that more will appear soon enough. The other sign – purple film – comes as a result of the breakdown of non-metallic dyes, which causes the film to turn a purple color. 2. Now you will move to the inside of the window. 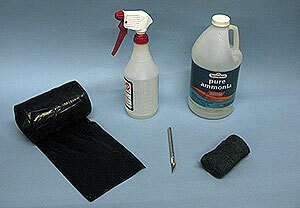 Before working on this step, make sure to cover all exposed interior surfaces (speakers, upholstery, etc.) 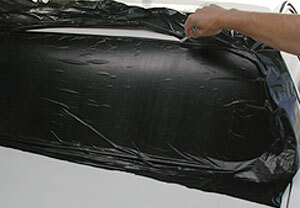 with cloth or tarp. Once everything is protected, take out the undiluted ammonia and spray the full inner surface of the window.It is a good idea to apply the ammonia while wearing a face mask, or at the very least while holding your breath, as undiluted ammonia gives off a powerful odor. 3. 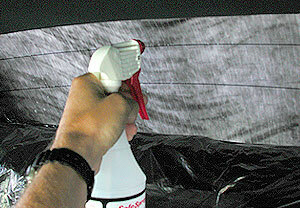 Immediately after spraying, place the second plastic sheet flush against the window to ensure that the surface area is fully wet with ammonia. At this point, you can take a break for an hour and wait for the ammonia to soften the adhesive. The best place to keep your car while waiting is in full sunlight with the surface of the window directly exposed to sunlight. 4. After one hour, you can start to peel off the film. Lift the window film starting from the corner with either a razorblade or just your fingernail, and peel it away all in one go if possible. 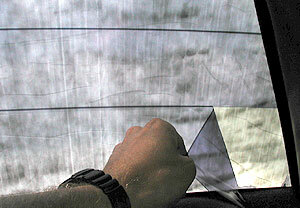 Make sure not to damage the defroster lines while doing so, and try to keep the film moist with ammonia to prevent it from getting hard again. 5. 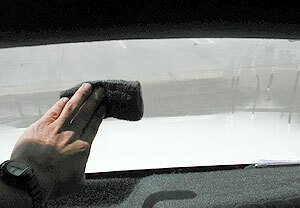 Once all the film has been removed, wipe away any leftover adhesive on the window with your super-fine steel wool and ammonia, and give it a good wipe with a dry paper towel. You can now take off the black plastic sheet from the outside and finish off the job by giving the window one final wiping with glass cleaner.